The wind’s screaming past your ears, the pavement’s flashing by in a blur, and everything’s right with the world. When suddenly it feels as though you’re pedaling through peanut butter. You’ve got a flat tire. 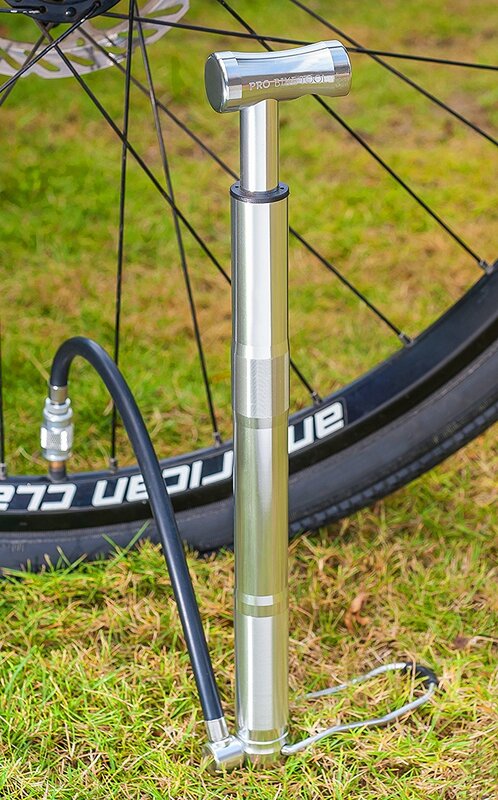 If you're too busy to read the guide, then go for Pro Bike Tool's Mini Floor Pump. It handles the highest PSI and has a foot peg for extra leverage. Proper tire pressure is essential to your bike’s handling and load-bearing capabilities. It also helps prevent punctures in the first place. If you get a flat tire on the road, you don’t have to settle for a “good enough” repair that allows you to limp home at half speed. A good pump built for touring will get you up and running again and give you the tire pressure you need to continue riding at full bore. Pro Bike Tool is a newcomer to the field. They’re a group of dedicated cyclists committed to delivering quality bike tools and excellent customer service. They may not have a long reputation to stand on, but the reviews on Amazon and other retailers are promising. 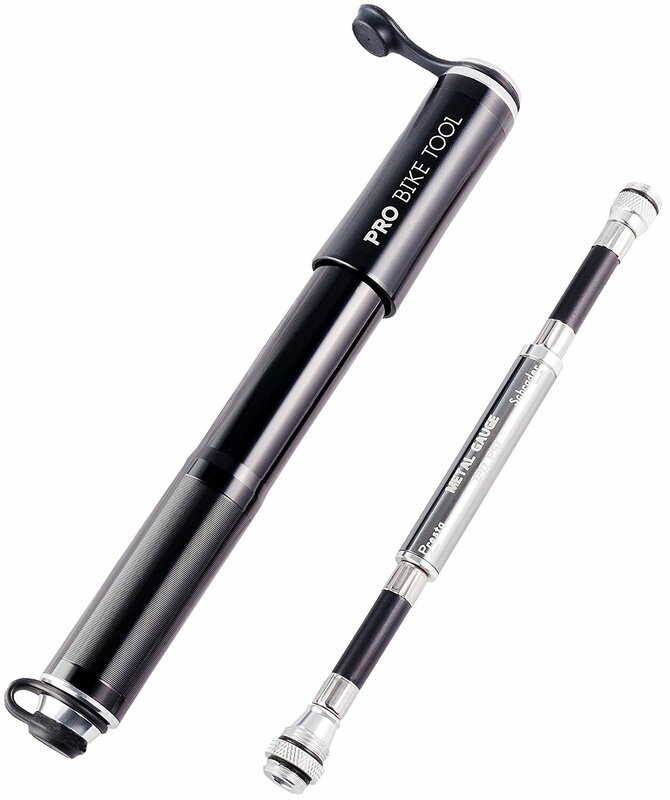 Pro Bike Tool’s mini tire pump is compact, tough, and lightweight. It measures 22.2cm long and about 2.5cm in diameter. If you’re the type to fret over weight, you’ll be glad to know this pump weighs only 127.6g. But don’t be fooled by its size: this tiny titan can deliver up to 120 psi and, thanks to its oversized piston, requires 30% fewer strokes to achieve your desired air pressure compared to other mini pumps. 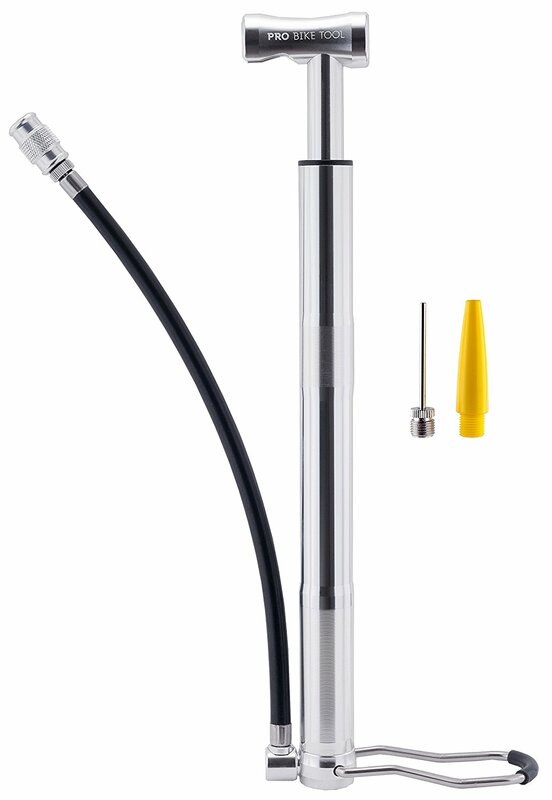 What are customers saying about the Pro Bike Tool mini tire pump? Users love the lightweight metal construction, the self-storing hose (a real space-saver), and the fact that the screw-on valve connector. It’s more time-consuming to use than a quick-release lever, but it stays firmly in place without popping off the way a quick-release sometimes does. Some reviewers dislike the mounting system and have said that the inner and outer cylinders of the pump can slide apart during a ride. 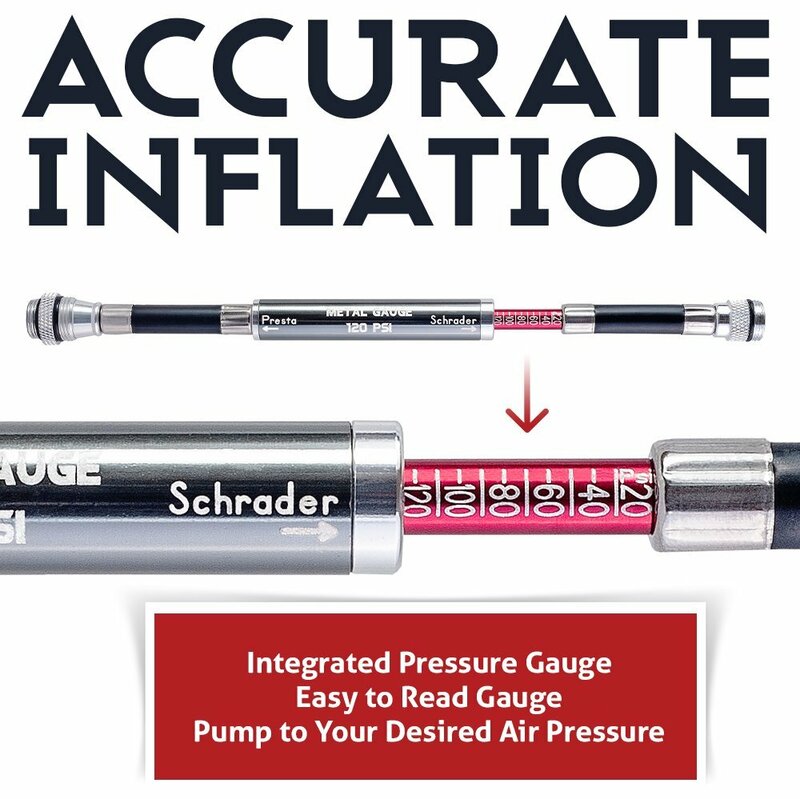 Others have reported that the integrated pressure gauge, while useful, is only accurate to about plus or minus 5 PSI. 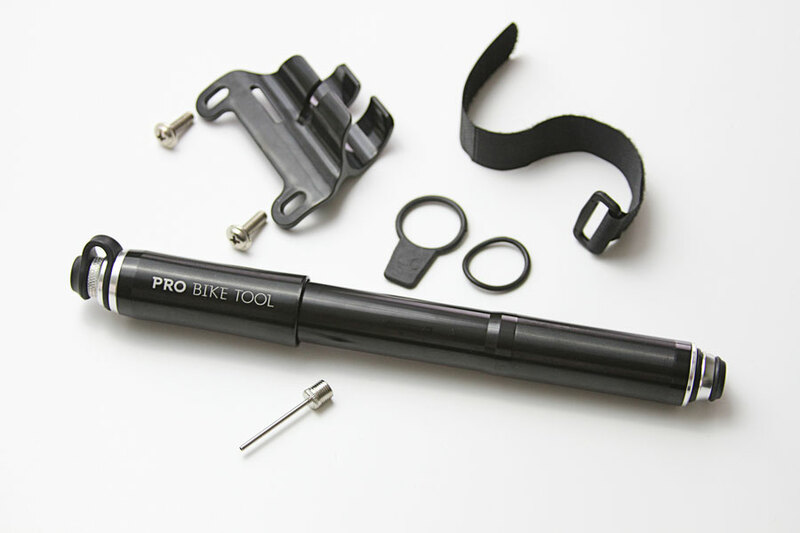 Almost universally, users praise Pro Bike Tool’s customer service, so if you have a problem with this pump you won’t be left high and dry (or flat and broke, as the case may be). Vibrelli is a fast-growing Australian company focused on making quality bike gear at low prices. They offer a lifetime guarantee on manufacturing defects and a replacement warranty on products that fail under normal, everyday usage. 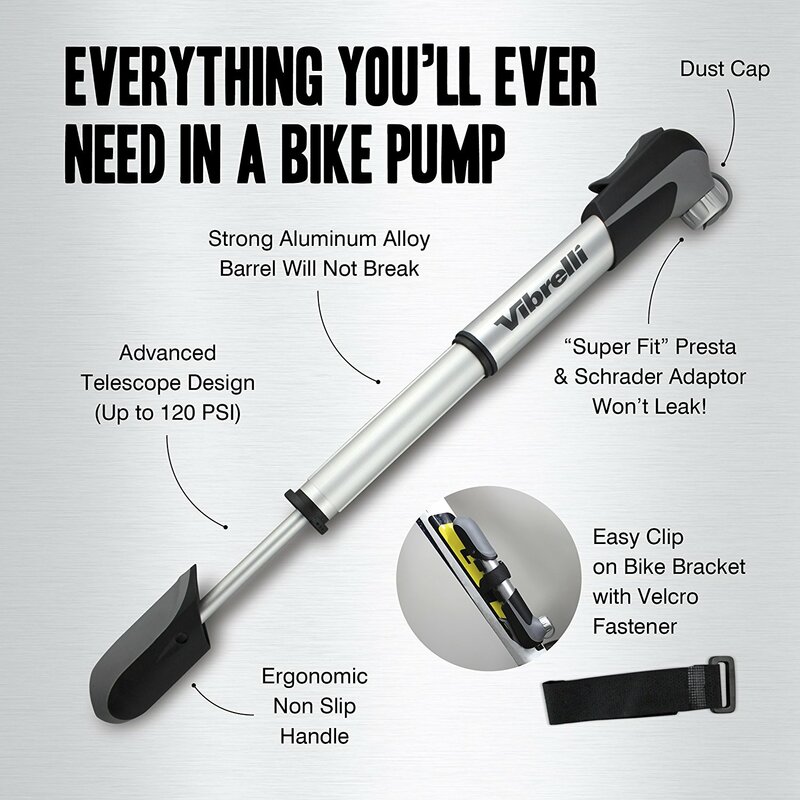 The Vibrelli Mini Bike Pump is constructed of a tough aluminum alloy. It’s 9 inches long but extends to a full 17 inches to make pumping easier on your arms. This pump can achieve an impressive 120 PSI—enough for all but the most high-pressure road bikes. The telescoping design allows you to switch between high-volume pumping (when you want to pump a lot of air fast) and high-pressure pumping (when you’re reaching higher PSI and need a little more “oomph” to squeeze in every last puff of air). One of Vibrelli’s main selling points is the “Super Fit Clever Valve,” which automatically connects to both Presta and Schrader valves—no adapters necessary. It fits both valve types firmly with no leaking. Vibrelli’s mini pump also comes with a glueless puncture kit. Why waste a perfectly good tube if a little patch job will get you up and running again? The pump mounts easily to your bike frame with a clip-on bracket and Velcro fastener. As an added bonus, Vibrelli even gives you a ball needle valve in case your basketball or football goes flat, too. Most reviewers love the size and telescoping construction of this pump. A common refrain is the incredible utility of the universal adapter that fits both Presta and Schrader valves. 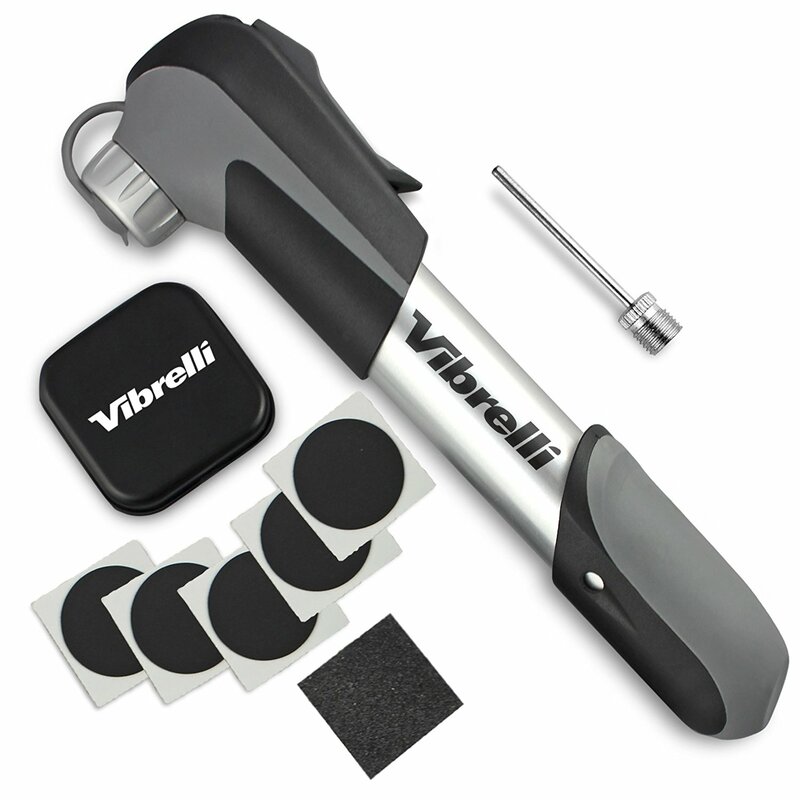 Some reviewers, however, have suggested that getting your tires to pressure is not as easy as Vibrelli makes it sound. Also, several users have noted that the glueless patches don’t hold very well and work as a temporary fix at best. My third pick is actually another Pro Bike Tool product. Their mini floor pump is a slightly different design from the previous two items on our list, but it’s definitely worth your consideration. This mini floor pump is slightly on the larger side, for a touring pump: 31cm long and 190g in weight. It’s crafted from machined aluminum alloy, so it’s durable and light for its size. One of the standout features of this pump is that it is, in fact, a floor pump. 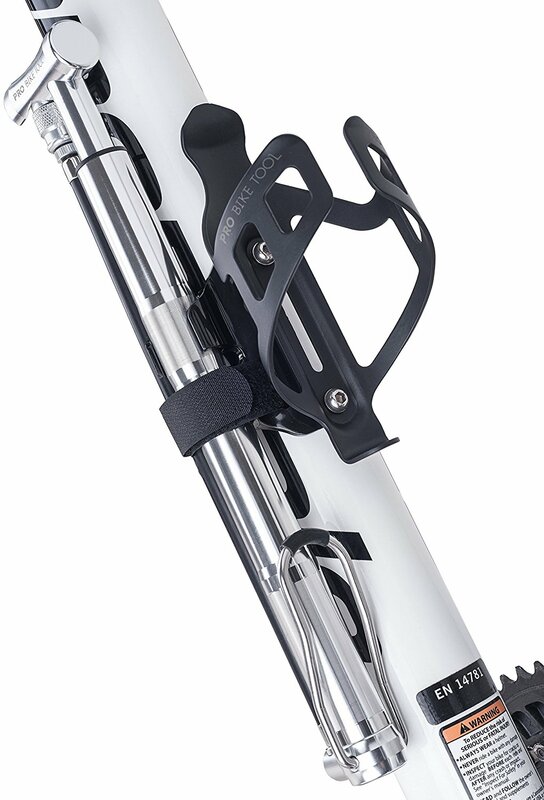 A stainless steel foot peg folds out from the bottom of the shaft to stabilize the pump. This allows for efficient and ergonomic pumping, just like a regular floor pump. If nothing else, it will save your arms a great deal of effort. Like the other pumps on our list, this one is both Presta and Schrader compatible. Reviewers have raved about this pump. Many praise its superiority over ordinary hand pumps; it inflates tires quickly, easily, and to full pressure—no limping home on a semi-firm tube. Its large size seems to be worth the tradeoff, considering the speed and ease with which it gets you on the road again. In fact, it’s difficult to find an unkind remark about this product. The only grievance that seems to get any air time is the lack of a pressure gauge. 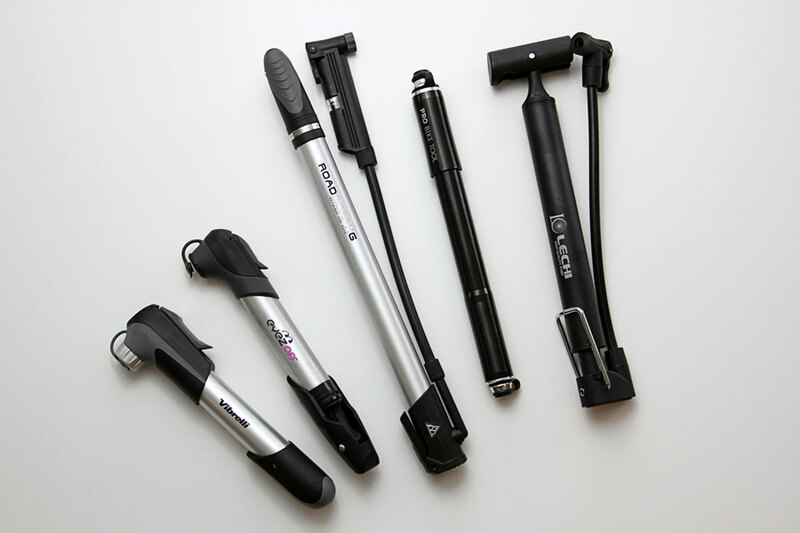 Do I need a portable bike pump? Buying a portable pump (or not) is a matter of personal preference and common sense. If you stick close to home on most rides and don’t mind hoofing it back home when you get a flat, riding sans-pump might be OK.
Also, mini-pumps may not work well on certain types of bikes. For instance, “fat bikes” run on extremely low pressure (10-25 PSI), and a difference of just one or two pounds of pressure will make a noticeable difference in handling. Portable pumps can pose a problem in two ways: one, they may not have a pressure gauge at all. Two, if they do have a pressure gauge, they may not even register pressures lower than, say, 20 PSI. But if you’re taking your road bike on a coast-to-coast camping trek, or if you just get a lot of flats, you’re probably going to want to have a reliable mini-pump with you. Sometimes walking home or waiting for a ride simply isn’t an option. Portability – Ever try to ride around with a full-size floor pump strapped to your back? 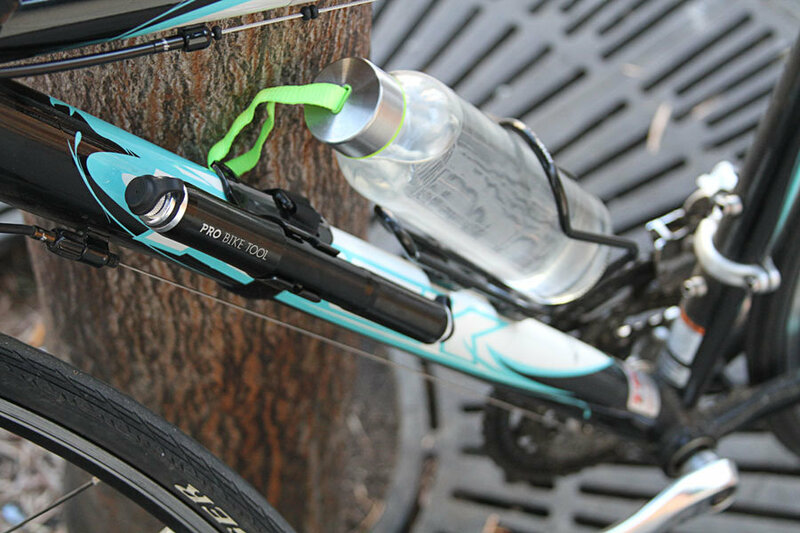 Mini pumps mount easily to your bike frame, or you can even slip them into a jersey pocket or sa﻿﻿ddle bag. Repairs on the go – It's unlikely you're going to have a support vehicle like a rider in the Tour de France. If you go flat in the middle of nowhere, you need a way to inflate a tube. More accurate than CO2 – CO2 cartridges are a fast, easy way to inflate a tube, but achieving the right pressure is more or less a guessing game. Not only that, but you’ll need to empty the tube and refill it at home anyway—CO2 dissipates through the rubber of the tube much more quickly than a regular air mixture. CO2 cylinders – OK, I just told you why a good, old-fashioned air pump may be better than compressed carbon dioxide. That doesn’t mean CO2 is a bad option. The cylinders are even smaller than mini-pumps, and they’ll inflate your tires in seconds, saving your arms a workout. If you’re not a stickler for precise pressure and don’t mind the gas leeching from your tube more quickly, this option is fine for a quick fix. Puncture-proof tubes and tires – The best fix for flat tires is to avoid them in the first place. There are a variety of “puncture-proof” tires on the market. Continental Touring Plus tires are a great example, employing a bead-to-bead woven construction, anti-pinch rib, and even a Kevlar belt to keep all things pointy away from your tube. Make no mistake: you can still get a flat with puncture-proof tires, but unless your ride takes you through a sea of broken glass, you’ll likely go thousands of miles between mishaps. Portable pumps may not be for everyone. If you stick to your own neighborhood and possess remarkable flat-avoiding luck, maybe all you need is a good floor pump to keep in your garage.